animates Carcassonne during the first two weeks of August, while July is one long arts celebration for the Festival de la Cité, highlighted by Bastille Day fireworks. Carcassone is one of the most visited cities of all France. The city is divided by the river , the "new" part of town is pleasant with lots of Cathedrals and some interesting points. On the other side there's the medieval walled city. Outstanding ! Stunning walled citadel with lovely shops and restaurants to discover and explore. At the edge of the beautiful river stands the imposing castle with its amazing views across the region and interesting cathedral, shops and chic restaurants and its free to enter!!!! You can travel here by car in 90 minutes or by train via Narbonne. The 13th century walled city is vibrant with history, art, cuisine, and just an excellent day trip for all. 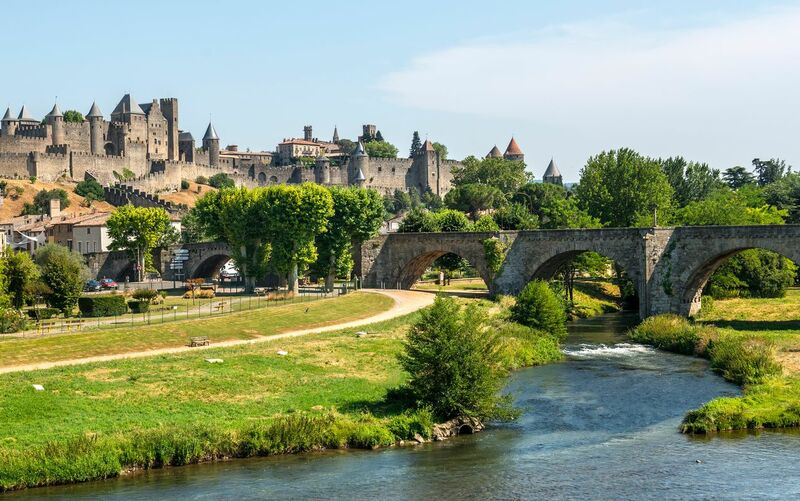 A charming town located in the South of France, Carcassonne is great for long weekends with the family. Rent a home further out or even stay in the old town, but down miss one of the many markets full of charm and colour and the rolling hills are great for morning jogs.